With an estimated 29.2% of all mobile calls in the US being spam in 2018, there no doubt things have gotten out of control. If you're fed up and want to block these spam calls on your Android phone, here are four ways to do it. Android has built-in call blocking – just tap a number in your call log and hit Block/report spam. But this method isn't very useful. First, someone has to call you in order to block the number. And since spammers rarely use the same number, or use the “neighborhood spoofing” technique, this won’t block the majority of spam calls we get. 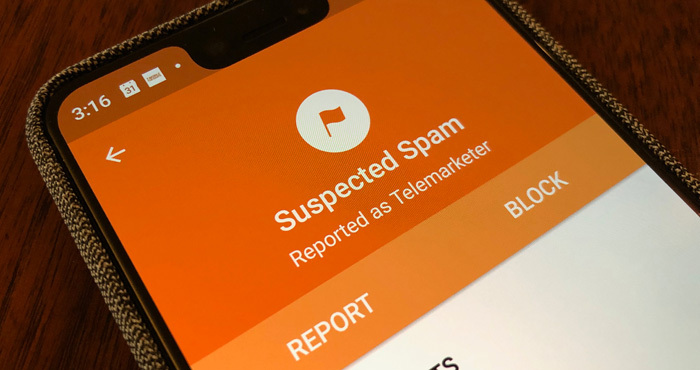 Android also has the option in the Phone app settings to automatically identify and block suspected spam calls so they don’t ring your device. It should be on by default, but you can check by going to Settings in your Phone app, then Caller ID & spam, and make sure both the Caller ID & spam and Filter spam calls switches are toggled on. This feature still sends those calls to voicemail, however. There is a new call screening feature for Pixel phones that allows Google Assistant to answer a suspected spam call and transcribe the conversation in real time, so you can decide if you want to answer the call or hang up. You'll see the option to screen a call when an incoming call comes in. Since Google Assistant picks up the call when you screen, hanging up won’t send the spammer to voicemail, though you still have to read the transcript and take action, which may be more of a pain than simply answering the call yourself. There are dozens of apps in Google Play that are labeled as call blockers. But you have to be very careful about which you install – you’re giving them full access to your phone, texts, contacts and more, meaning there’s a lot of potential for misuse. And each of those apps will only perform as well as the technology (and the blacklist) running it. The best have large communities of millions of users who are constantly submitting new numbers to the suspected spam list. I strongly recommend going with one of the top-rated brand name choices, such as Hiya or Truecaller. Personally, I prefer Hiya (which whitelabels its technology to Samsung, AT&T and others), has an extensive community-driven blacklist, allows you to block neighborhood spoofing calls, and even provides caller ID features that you would usually have to pay for with your carrier. The downside to Hiya is that it requires a $2.99 per month subscription to get caller ID and spam blocking. The free version provides spam notifications on calls and gives you the option to ignore them, but they're not blocked. Thankfully, both versions offer area code blocking, which is a sizeable portion of the spam calls I get on a regular basis. Unlike Hiya, Truecaller's free version has spam call blocking and caller ID. However, it doesn't have that critical area code blocking feature to stop those neighborhood spoofing calls. Also, while both these apps will block calls, because of restrictions placed on apps by the Android operating system neither can stop those calls from going to voicemail. Google Voice provides another way to block pesky spam calls and, better yet, can prevent them from going to voicemail. The trick is you need to switch to Google Voice as your main number and stop giving out your old carrier number. With Voice, you can block known spam calls in three ways: by sending those calls to voicemail, by treating the call as spam (letting the caller leave voicemail but tagged as spam) or by call blocking (in which case the caller will hear a “Number not in service” message and will not be able to leave voice mail). The big drawback here is that your Google Voice number now becomes your main number, which you forward to the number from your carrier, and that takes some work to transition. And there’s still no guarantee that spam callers won’t call your carrier number directly, either because it’s already out there (learn how telemarketers get your number) or simply because the robodialers are going through every number combination. Truly effective call blocking and voicemail prevention should be at the carrier level. It’s the carriers who have the technical capability to identify call origination sources and create services that prevent spam and blocked calls from going to voicemail (since they’re the ones that control the voicemail service). And all the carriers have some level of blocking on their networks to weed out the most obvious and egregious spammers. Significant improvements will come later in 2019 when some of the carriers roll out the new SHAKEN/STIR framework. Until then, these are your options. Of the four major carriers, AT&T has the most effective tools for blocking spam calls and it’s the only one that actually lets you stop these calls from going to voicemail. AT&T postpaid customers with HD Voice Android can activate AT&T’s free Call Protect service on their accounts. Call Protect will block known spam calls entirely, preventing them from leaving a voicemail. And with the companion Android app you can also block specific numbers. If you want more features, you can upgrade to Call Protect Plus for a pricey $3.99 a month. Call Protect Plus users can block categories of calls, including: private callers, debt collectors, telemarketers, surveys, and general spam. You can choose to have these calls go to voicemail or be blocked entirely. Unfortunately, there is no option to block local number spoofing. Sprint has the weakest offering of the four main carriers. Their Premium Caller ID service provides caller information on incoming calls, including spam warnings, but that’s it. There’s no option to block known spam calls or prevent them from going to voicemail. And, you have to pay $2.99 a month for this basically useless feature. T-Mobile sits in the middle when it comes to spam call protections. For postpaid customers, T-Mobile’s free Scam ID service is automatically activated and will notify you of potential spam calls. But what you really want is their Scam Block feature, which will block these calls from ever reaching your device and prevent the caller from leaving a voicemail. Scam Block is also free but requires you to manually activate it, which you can do simply by dialing #662# from your phone (you can also disable it by dialing #632# if it is blocking any valid calls). There is no option to block categories of calls or neighborhood spoofing. Though, for $4 a month, you can get the not-very-useful Name ID service with more advanced caller ID and caller category info. Verizon’s Call Filter will identify likely spam callers and give you the option of automatically blocking them based on risk level: High Risk, Medium Risk or All Risk Levels. However, those blocked calls will still go to voicemail and Call Filter requires a $2.99 per month subscription fee – in essence, you’re getting the same level of blocking that Android or Truecaller provides for free, but Verizon is charging you for it. Read our advice for blocking spam on your landline, too.